Core technology that can be applied countless ways. Send us an inquiry. We're here to help! Elliott’s Control Cable Assemblies are available in countless variations including the ever-popular groove or bulkhead end configurations. Among the many standard end fittings are built-in swivels that enable a 8° deflection each side of center with a conical deflection of nearly 20° in total to accommodate control arm movement. Elliott’s Control Cables are available in 30, 40, 60 and 80 series cables. Cable size is determined within Elliott’s engineering department, through testing and experience and based on the length of the cable, normal & extreme usage, resistance and operating life and conditions. A broad and deep offering Control Cable Ends, Fittings & Accessories have made Elliott the preferred supplier to many of the leading names in agriculture, aerospace, automotive, commercial and industrial markets. For severe operating conditions such as extreme heat and cold (-70F-350F) and for especially rugged applications, look to the leading supplier of functional yet practical Push-Pull Cables & Controls–Elliott e-novation! How Long Has Elliott Been Manufacturing Control Cables? In 1879, Nelson Stow invented and patented flexible shafting, a method of transmitting power from a remote source to a controllable mechanism. Almost one-hundred-and-forty years later, Elliott has extended its product line to include a wide array of control cables specially designed for reliable and economical operation. What is a Control Cable? Be it a Push/Pull or Control Cable, the assembly allows you to transfer motion in a simple yet reliable manner. If you know your stroke (travel) length, overall length and application environment, our Application Engineers can direct you to the cable right for you. Contact Us now for assistance! What types of Control Cables are there? Light Load Connector Controls: Suited for less demanding applications and are available with or without a protective nylon outer tube for corrosive resistance. 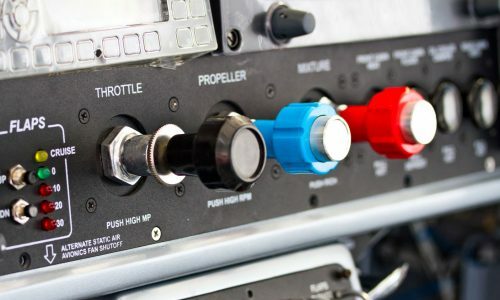 These products can connect an existing lever with the device you with to operate. They are perfect for dampeners, vents and valves. Cables can employ a loop on the end which may be centered on tangent or a specific orientation between loops. Heavy Load Duraglide Connector Controls: A more robust alternative to our light load line, these Control Cables are designed for long life in demanding environments. Many of our customers have employed these units in agricultural or heavy construction applications because they use a high-density polyethylene and stainless steel inner to reduce the possibility of corrosion. Push/Pull Cables: A wide variety of Push-Pull Cable ends, fittings and accessories make Elliott the preferred supplier to the many market leaders. Our products are rated between -70°F to 350°F and function in the most demanding and rugged applications. Our Application Engineers will quickly turn your concepts into functional prototypes for testing and evaluation. Contact Us now for assistance! What should I know before speaking to an application engineer? Obviously the more information the better, but we’re happy to help you through it. Some of the details we’re going to want are: application, load, envelope, required bend, is an end fitting required, is backlash important, operating environment (specifically vibration, temperature and corrosive/abrasive agents), cycle life and friction. Click Here for assistance.